Cut a length of string for a necklace. Punch a hole near the top of each leaf. Thread one leaf onto the string and tie it about two thirds of the way along. 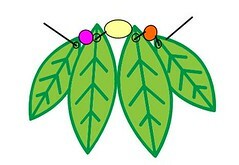 Thread alternately, a piece of pasta and a leaf, or a bead and a leaf, or a combination of all three, until your leaves fill the middle third of the string. Tie the end of the string together to make a necklace. Paint dots on the leaves before threading them. However, you will need to let the paint dry before threading them. Paint dots on afterwards. This will be more challenging for your toddler to handle, and could end up quite messy. You can use large buttons instead of pony beads, or anything that has a hole large enough for your toddler to thread the string through. Safety first: Avoid small items that young children might put in their mouths and accidentally swallow or inhale.